By now you know we just love lamb — cooked any which way. In this fabulous recipe, the lamb is first marinated, then roasted with potatoes. Prepared in an earthenware casserole, a cazuela, the lamb dish was once made in village wood-burning bakery ovens in Galicia Spain on festive occasions. Our cazuela, found at Home Goods for a VERY reasonable price, was ready to take its maiden voyage. Cazuela is the common name given to a variety of dishes, specially from South America. It receives its name from the cazuela (Spanish for cooking pot, generally sold without lids) in which it is cooked. The ingredients and preparation vary from region to region, but it is usually a mid-thick flavored stock obtained from cooking several kinds of meats and vegetables mixed. 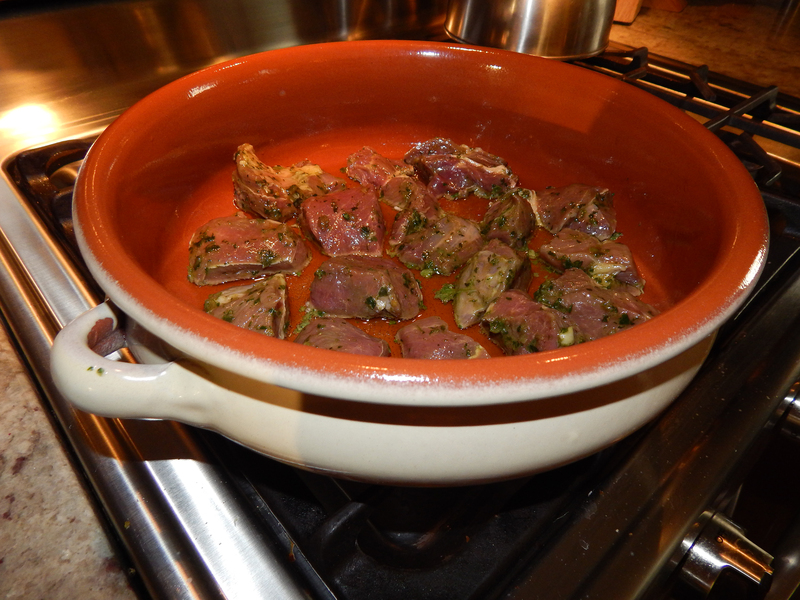 Browning the lamb in batches in the cazuela. 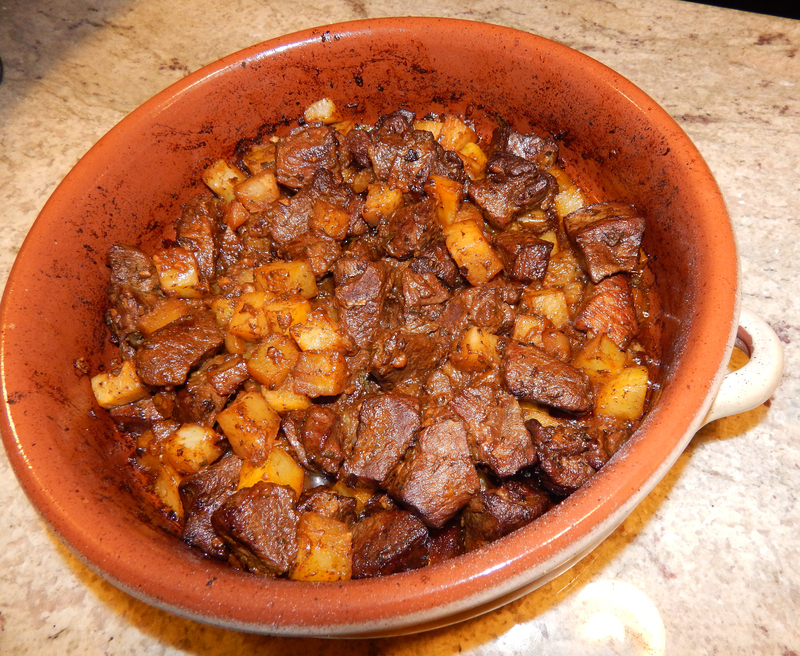 Wonderfully aromatic Digna’s roasted lamb with potatoes. In a mortar, mash to a paste one-quarter of the minced garlic cloves with the bay leaves, parsley and a 1/4 tsp. salt. Stir in 4 Tbsp. of the oil and 2 Tbsp. of the wine. Marinate overnight or longer in the refrigerator. NEXT DAY: Preheat oven to 375 degrees. Add the meat with marinade and brown over high heat. Remove casserole from heat and add remaining 2 Tbsp. oil, 4 Tbsp. wine, the broth, rest of garlic, the cloves, and salt and pepper to taste. Place in oven and roast for 30 minutes, uncovered. Add the potatoes, sprinkle them with salt and saffron, and continue cooking another 30 minutes more, until potatoes are tender. 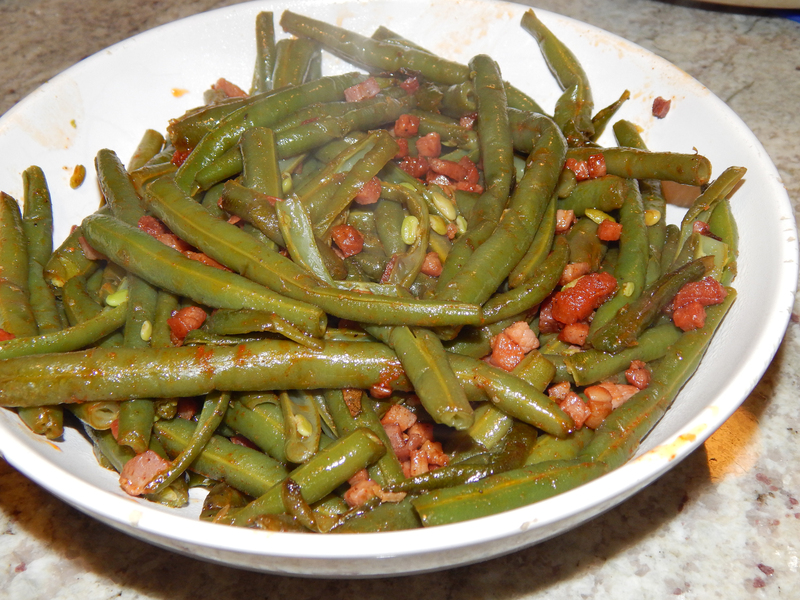 Sautéed green beans, cáceres style. We served the lamb entree with a green bean dish, also from Penelope Casas book, “Sautéed Green Beans, Cáceres Style.” The veggies gain flavor from the additions of pancetta (or prosciutto as we used), paprika and vinegar. 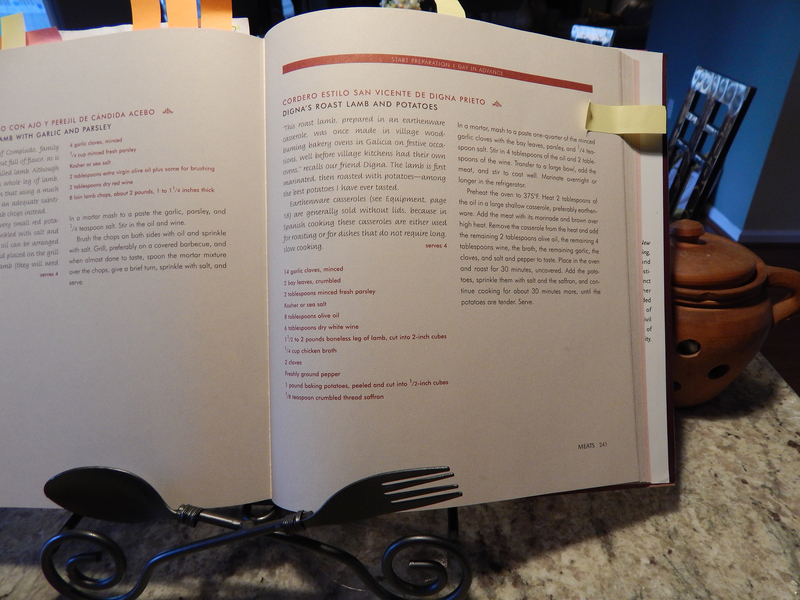 Penelope Casas’ La Cocina de Mamá book open to the roasted lamb recipe.